Our office was contacted to have pool equipment installed in Chula Vista, CA. 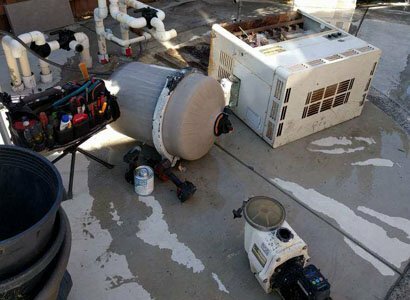 The pool owner wanted to upgrade the pool pump, filter, pool heater and add a new salt water chlorine generator. 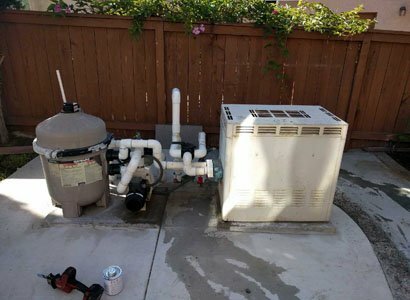 Upon scheduling a pre-site, the homeowner advised that he only needed a price to install the new equipment. He explained that he was going to provide the equipment and was simply looking for a licensed swimming pool contractor. A licensed pool professional that could install the pool equipment correctly for a fair market price. 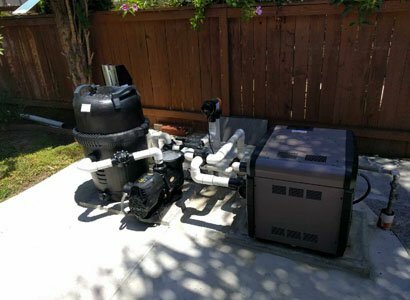 When our pool repair and new equipment installation technician arrived we inspected the new pool equipment.There was a Hayward H-Series pool heater, Jacuzzi pool filter, Jacuzzi pool pump, and a jacuzzi salt water chlorine system. As a Licensed swimming pool contractor, we will install pretty much anything pool or hot tub. And when a customer is providing the pool equipment, we are happy to help with getting the new pool equipment installed. The Hayward H-Series brand of pool heaters is an environmentally friendly, energy-efficient pool heater. 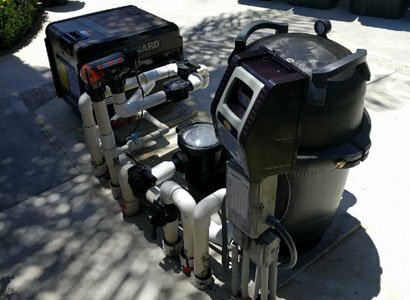 This pool heater installed in Chula Vista is energy efficient due to its low emissions. It also has a digital LED control panel making this pool heater very user-friendly. This Jacuzzi variable speed, energy efficient pool pump saves you money on energy costs. A pool pump that decreases your runtime while still providing professional grade quality. D.E Quad Filters are designed to filter the finest material while being easier to clean like a cartridge pool filter. They are designed to clean better though, we always prefer installing a cartridge filter. Cartridge filters work great, are easy to clean the filter and the cost for pool filter parts is reasonable. With all salt water chlorine generators, they all do the same thing. That is to create a sanitizer in the water that allows lower levels of chlorine. Because a salt water chlorine system runs each day replenishing the pool’s chlorine level. With that, it allows us to keep the residual lower than a regularly chlorinated pool. If you live in Chula Vista or another area of San Diego, we can help. If you need pool repairs or wanting to have new pool equipment installed. Give us a call or fill out our contact form for more information today.